Amphetamine belongs to the phenylethylamine family with a methyl group substitution in the alpha carbon position. · Amphetamine belongs to the phenylethylamine family with a methyl group substitution in the alpha carbon position. Numerous substitutions of the phenylethylamine structure are possible, resulting in several amphetamine-like compounds. These compounds have now collectively come to be known as “amphetamines”, and include amphetamine phosphate, amphetamine sulfate, benzphetamine, chlorphentermine, clobenzorex hydrochloride, dextroamphetamine, diethylpro-pion, mazindol, methamphetamine, 4-methylthioamphetamine, methylphenidate, pemoline, phendimetrazine, phenmetrazine, and phentermine. · In the late 1980s, a pure preparation of methamphetamine hydrochloride made its appearance for the first time in Hawaii where it was referred to as “batu”. It quickly made its way across to the United Kingdom, Australia, Western Europe, and USA, where it became popular by the slang name “ice” (or “glass”) (Fig 34.15). While ice is produced by the ephedrine reduction method and is very pure, occurring as large translucent crystals, a variant produced by an oil-based method is called “crystal” (or “crank”), and is a white to yellow crystal product. · Methamphetamine abuse began in the 1950s and reached a peak in the 1970s. It used to be referred to as “speed” or “go”. The newer avatars “ice” and “crystal” are virtually the same in their pharmacological and toxic effects. Other slang names include “chalk” and “meth”. Methamphetamine powder can be inhaled, smoked, ingested, or injected. Ice and crystal are almost always smoked. Some amphetamines have therapeutic uses and are still avail-able as prescription drugs in Western countries (Table 34.13). They are not available in India. The major mechanism of action of amphetamines involves the release of monoamines from storage sites in axon terminals, which leads to increased monoamine concentration in the synaptic cleft. The release of dopamine in the nucleus accum-bens and related structures is responsible for the reinforcing and mood elevating effects of amphetamines. Cardiovascular effects result from the stimulation of release of noradrenaline. The dopamine released into the cytoplasm of neurons undergoes oxidation, resulting in the production of several toxic chemicals (oxygen radicals, peroxides and hydroxyquinones). Methylphenidate has a different mechanism of action. Like cocaine, it produces CNS action by blocking the dopa-mine transporters responsible for the reuptake of dopamine from synapses following its release. The relatively low abuse potential of orally administered methylphenidate is due to slow occupation of dopamine transporters in the brain. Also, unlike cocaine, methylphenidate occupies the transporter sites for a much longer time. Amphetamines also have weak monoamine oxidase inhib-iting property, but the significance of this is not clear. The most prominent effects of amphetamines are the catecholamine effects as a result of stimulation of peripheral alpha- and beta-adrenergic receptors. Enhanced concentration of noradrenaline at the locus coeruleus is responsible for the anorexic and stimulating effects, as well as to some extent, for the motor-stimulating effects. The increase in central dopamine (especially in the neostriatum) provokes stereotypical behaviour and some motor effects. The activity of dopamine in the neostriatum appears to be linked to glutamate release and inhibition of GABA-ergic efferent neurons, contributing significantly to the stereotypical behaviour, locomotor effects, and neurotoxicity of amphetamines. The effects of serotonin and dopamine at the mesolimbic system alter perception and induce psychotic manifestations. In general, peak plasma levels are seen in about 30 minutes after intravenous or intramuscular injection, and about 2 to 3 hours after oral amphetamine ingestion. Amphetamines are extensively metabolised in the liver, but much of what is ingested is excreted unchanged in the urine. They differ from catecholamines in that they lack the catechol structure and therefore cannot be metabolised by catechol-o-methyl transferase (COMT), which permits oral efficacy. In general, amphetamines are lipophilic, and hence can cross the blood-brain barrier easily. Protein binding is 16% for amphetamine, 15% for meth-ylphenidate, and less than 40% for pemoline. Amphetamines have large volumes of distribution, varying from 3 to 5 L/kg for amphetamine, to 11 to 33 L/kg for methylphenidate. The half-life ranges from 7 to 30 hours. The half-life is considerably shortened when the urine is acidic. The excretion of unchanged amphetamine is dependant on pH, and at urine pH less than 6.6, a range of 67 to 73% of unchanged drug is excreted in the urine. At urine pH greater than 6.7, the percent excreted unchanged in the urine is reported to be 17 to 43%. –– Hyperthermia: can be severe, and may result from hypothalamic dysfunction, metabolic and muscle hyperactivity, or prolonged seizures. –– Coma: If it occurs, is associated with a high mortality rate. –– Tachycardia: Tachycardia is common, however, reflex bradycardia secondary to hypertension can occur. –– Hypertension: Hypertension is common following amphetamine use and may result in end organ damage. Pulmonary hypertension has been associ-ated with methamphetamine use. Hypotension and cardiovascular collapse may result from severe toxicity, and is associated with a high fatality rate. –– Myocardial ischaemia: Infarction can occur (videinfra). –– Cardiomyopathy: Acute and chronic cardiomyo-pathy can result from hypertension, necrosis, or ischaemia. –– Ischaemic colitis: More common in chronic poisoning (vide infra). –– Rhabdomyolysis: Develops in patients with severe agitation, muscular hyperactivity, hyperthermia, or seizures. -- Metabolic acidosis: This occurs with severe poisoning, and has even been reported after smoking crystal methamphetamine. –– Aortic dissection: Several cases of fatal aortic dissection associated with chronic amphetamine use have been reported. –– Acute renal failure: Renal failure may develop secondary to dehydration or rhabdomyolysis in patients with severe amphetamine poisoning. Death due to amphetamine toxicity most commonly results from arrhythmias, hyperthermia, or intracerebral haemorrhage. In cases of survival, symptoms gradually resolve as the drug is excreted over a period of 24 to 48 hours. Chronic Poisoning: Amphetamines can be taken orally,by injection, by absorption through nasal and buccal membranes; or by heating, inhalation of the vapours, and absorption through the pulmonary alveoli. Inhaled ampheta-mine is almost immediately absorbed with a rapid onset of effects. Unlike cocaine, amphetamines can be vapourised without much destruction of the molecule, thus obviating the need for preparing a free-base form for smoking. As with opiates, the rapid onset of effects from amphetamine injection or inhalation produces an intensely pleasurable sensation referred to as “rush”. Intermittent low-dose misuse: Some individuals(students studying for exams, military personnel on extended exercises, athletes, truck drivers on night trips, etc. ), consume amphetamines periodically to overcome fatigue, prolong wakefulness, or elevate mood. They usually do not develop dependence. Sustained oral misuse: Some individuals who havebeen prescribed amphetamines for legitimate purposes, as well as some others who have been using these drugs illicitly may continue to ingest them in relatively large daily doses of 40 to 100 mg or more (as tolerance develops). Attempts to reduce the dose result in depres-sion and lethargy. High-dose IV abuse: Individuals who relish theeuphoria induced by amphetamines quickly progress to IV injections in order to enhance the “rush” or “flash”. These individuals (“speed freaks”) classically manifest the symptomatology of chronic amphetamine toxicity. They are also prone to “speed binges” wherein there are repeated cycles of action and reaction phases. The former is due to intake of the drug resulting in a “high”, while the latter is due to stoppage, and is associated with acute hunger followed by intense depression or “crash”. This provokes him to go on the action phase again, and the cycle continues until collapse or financial ruin. Inhalant abuse: WhenBenzedrineinhalers were avail-able, a significant proportion of users became addicted. The 1959 FDA ban on these inhalers led to the introduc-tion of Benedrex inhalers (containing propylhexedrine, methanol, and aromatic compounds). By the 1970s, addiction to these inhalers became a major problem. Today, all amphetamine analogues have been banned from inhalers. However, there are indications that the apparently innocuous Vicks Nasal Inhaler (containing l-desoxyephedrine, which is actually l-methampheta-mine)* may have high abuse potential. Manifestations of heavy chronic amphetamine use: –– Hyperactivity, hyperexcitability. –– Anorexia, loss of weight, emaciation: Weight loss is one of the most characteristic findings with chronic use of amphetamine or its derivatives, and is said to be the most striking effect in chronic “ice” smoking. –– Vomiting and diarhoea are common. Ischaemic colitis may occur. –– Stereotyped behaviour (skin picking, pacing, inter-minable chattering). –– Paranoid psychosis, unpredictable violence: In one study, the most common symptoms in patients with methamphetamine-induced psychosis were auditory and visual hallucinations, persecutory delusions, and delusions of reference. They also demonstrated a high tendency for major depres-sive disorder, alcohol dependence, and antisocial personality disorder. –– Heightened sexual activity initially, followed by impotence and sexual dysfunction. –– Occasionally, very rapid IV injection of a large dose produces a condition called “overamped”, charac-terised by inability to speak or move even though consciousness is fully retained. Blood pressure and temperature are usually elevated. There may be respiratory distress. –– Deterioration of social (family problems), physical (slovenly, unkempt appearance), and economic (loss of job, bankruptcy) status. –– Adverse psychological reactions—anxiety reactions, amphetamine psychosis, exhaustion syndrome, depression and hallucinosis. –– One study revealed that postmortem levels of striatal dopamine in some methamphetamine users were reduced to levels similar to those seen in patients with Parkinson’s disease in the caudate, but not in the putamen subdivision of the striatum. This reduction of the neurotransmitter in the striatal subdivision could explain the presence of cognitive problems in methamphetamine users. –– Medical complications—cardiomyopathy, vascu-litis, pulmonary hypertension, permanent neurolog-ical deficits, HIV infection, hepatitis, endocarditis, osteomyelitis, and pulmonary abscesses. Case reports of hepatotoxicity resulting in hepatocellular injury have been reported in children receiving pemoline. As of September 1999, pemoline has been withdrawn from some Western countries. In one case, a young boy unresponsive to other drugs in the treatment of his attention deficit/hyperactivity disorder (ADHD), received 75 mg/day of pemoline. This resulted in liver failure which required trans-plantation. –– Obstetric complications (in pregnant users)— eclampsia, intrauterine growth retardation, prema-turity, etc. Amphetamine use during pregnancy has also been associated with birth defects, increased risk of cardiac malformations and cleft palate. –– Intravenous injection abusers may display skin lesions, such as “tracks”, abscesses, ulcers, cellu-litis, or necrotising angitis. Withdrawal syndrome: Withdrawal after prolongedamphetamine abuse may precipitate severe depres-sion and suicide attempts. Anxiety, abdominal cramps, gastroenteritis, headache, diaphoresis, lethargy, and dyspnoea may result. Increased appetite is common. · Urine is the specimen of choice. Levels above 2 mg/100 ml indicate acute toxicity. Methods of analysis include TLC, RIA, HPLC, and GC-MS. The first three methods often give false positive results, and hence confirmation of a positive test must always be done by GC-MS.
· A new method (electron-impact mass fragmentography) enables detection and even quantitation of methampheta-mine in hair, nails, sweat and saliva. · Hair analysis may provide documentation of metham-phetamine or other drug exposure for several months or longer. The condition of the hair (wet, dry, dirty, permed or dyed) does not affect results. To obtain hair samples, a new disposable scissors should be used to cut a very small amount of hair (100 mg total, about the width of a pencil) from about 10 different places. The hair must be cut as close to the scalp as possible. The fatal dose of amphetamines is highly variable, and while death can occur with as little as 1.5 mg/kg of methamphetamine, survival has been recorded with 28 mg/kg. This in fact repre-sents the usual range of amphetamine’s lethal dose—150 mg to 2 grams. However, because of tolerance, addicts can tolerate up to 5 grams (single IV dose), or 15 gm/day (smokable meth-amphetamine). Lethal blood level is said to be around 0.2 mg per 100 ml, though addicts can tolerate much higher levels with hardly any toxic effects. –– IV line, cardiac monitoring. –– Oxygen. –– Evaluate blood glucose, BUN, and electrolyte levels. –– Consider the necessity of a CBC, urinalysis, coagu-lation profile, chest X-ray, CT scan of head, and lumbar puncture, depending on the presentation. –– Shock is a poor prognostic sign and needs to be managed effectively. Consider the need for right-sided heart catheterisation to measure right-sided filling pressure and cardiac output. –– Airway management, ventilatory support. –– Rapid rehydration. –– Mannitol diuresis promotes myoglobin clearance to prevent renal failure. –– Assess psychological and neurological status. –– Gastric decontamination (in cases of ingestion) with appropriate tracheal protection. Activated charcoal is beneficial. –– Anxiety, agitation, and hyperactivity can usually be controlled with benzodiazepines. Diazepam is the drug of choice, and is administered in a dose of 10 mg IV at intervals (up to a maximum of 100 mg). Much larger doses (hundreds of milligrams) may be required to obtain adequate sedation. Titrate dose to clinical response. 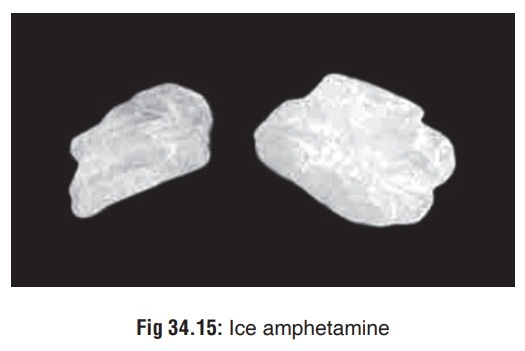 Control of agitation is an important aspect to the treatment of amphetamine overdose, since it often leads to hyperthermia, a common cause of mortality in amphetamine overdose. Neuroleptics are generally not preferred since they may aggravate hyperthermia, convulsions, and cardiac arrhythmias. Physical restraint is inadvisable, since resistance against such measures will aggravate rhabdomyolysis and hyperthermia. –– Extreme agitation and hallucinations may require the administration of IV droperidol (up to 0.1 mg/ kg). Since haloperidol lowers the seizures threshold, and is associated with neuroleptic malignant syndrome, it is not advisable. –– Convulsions can be managed with benzodiaz-epines (IV diazepam), phenytoin, or barbiturates. Refractory cases may require curarisation. –– Hyperthermia should be tackled aggressively with hypothermic blankets, ice baths, and dantrolene infu-sions. Large IV doses of benzodiazepines can help. Refractory cases must be subjected to neuromuscular paralysis and mechanical ventilation. –– Tachycardia can be managed with beta blockers (atenolol). Labetolol which has combined alpha and beta blocking effects, may be preferable if tachycardia is associated with hypertension. Sedation with intra-venous benzodiazepines (diazepam 5 to 10 mg IV repeated every 5 to 10 minutes as needed) is usually sufficient for treating hypertension. A short acting, titratable agent such as sodium nitroprusside should be considered if unresponsive to benzodiazepines. –– For ventricular arrhythmias: Lignocaine and amiodarone are generally first line agents for stable monomorphic ventricular tachycardia. Sotalol is a good alternative. Amiodarone and sotalol should be used with caution if the QT interval is prolonged, or if torsades de pointes is involved in the overdose. Unstable rhythms require cardioversion. Atropine may be used when severe bradycardia is present, and PVCs are thought to represent an escape complex. –– For rhabdomyolysis: Early aggressive fluid replace-ment is the mainstay of therapy, and may help prevent renal insufficiency. Diuretics such as mannitol or furosemide may be needed to maintain urine output. Urinary alkalinisation is not routinely recommended. –– Diazepam and chlorpromazine have been effective in treating amphetamine-induced chorea. –– Other complications should be anticipated and treated as and when they arise. –– Although peritoneal dialysis and haemodialysis have been demonstrated to enhance elimination of amphetamine, the clinical efficacy of these procedures in human overdose has not been proven and they are rarely if ever clinically indicated. Acidification of urine enhances amphetamine excretion, but may precipitate acute renal failure in patients with myoglobinuria and is therefore contraindicated. a. Most casual users of amphetamines do not need treat-ment. Those with moderately severe dependence can be treated on an outpatient basis without using drugs. Strategies range from residential and ambulatory detoxi-fication to day treatment, multistep activities, and case management. It is preferable to provide a structured and manualised cognitive behavioural treatment, making use of a combination of group and individual counselling. b. A wide variety of pharmacological agents have been tried as adjuncts to (or major elements in) the treatment of amphetamine dependence. These include drugs such as imipramine and fluoxetine, but results have been disappointing. c. In some European countries, low-dose amphetamines are administered to addicts as part of the detoxification programme in the initial stages, to assist the subject over-come the phase of “craving”. There are however doubts expressed by other investigators over such an approach.